The CT-4 Airtrainer was born out of two situations that occurred in the early 1970's. 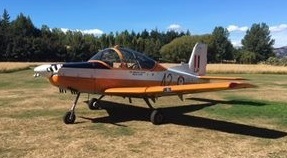 Firstly the failure of the T6/24 Airtourer to meet the Royal Australian Air Force (RAAF) requirement for a basic trainer. Secondly the foresight of the AESL management of the time to exercise an already held option on the production rights to the Victa Aircruiser and adapt it into what we know as the CT-4 Airtrainer. Development included a jettisonable clamshell canopy, revised seating and interior, and structural strengthening for aerobatic work. The wings are constructed separately, and during their installation to the fuselage are joined by splicing the two protruding main spars at 6 deg 4 min of dihedral on the top of the spar and 3 deg incidence at the root. Conventional control surfaces are utilised, with electrical spring bias trimming devices provided for the rudder and elevator and fixed tabs for the ailerons. Flaps are electrically operated and can be set at any position, while the fixed under-carriage has a steerable nosewheel and the wheel brakes are toe operated. The first CT/4 Airtrainer s/n 001 first flew on 23 February 1972 (ZK-DGY). AESL secured a RAAF contract to supply 37 aircraft. This order was followed by another from the Royal Thai Air Force for 24 aircraft. These orders prompted the merger of AESL with Air Parts (NZ) Ltd and with the involvement of the New Zealand Government, New Zealand Aerospace Industries was formed. A further order from a Swiss company named Breco had been secured for 14 Aircraft and these immediately followed the last RAAF Aircraft down the line. These aircraft were designated CT-4B but were not the same as the civil CT-4Bs that were produced at a later date. They were in fact destined for Rhodesia (Zimbabwe) which was UN sanctioned at the time and the NZ Government prevented their export and consequently they were never delivered (although paid for). The Royal New Zealand Air Force was next to sign up for CT-4s with an order for 13 aircraft. These were produced in 1976 ending with s/n 090. Although initially they were to be CT-4D models the aircraft were data plated as CT-4B, however technically they were neither as they were not built to the Type Certificate but to a RNZAF specification. The CT/4B designation described a higher all up weight requirement by the RNZAF to accommodate additional avionics. When NZASIL announced the termination of CT-4 production the RNZAF in 1978 ordered a further 6 aircraft as attrition airframes. 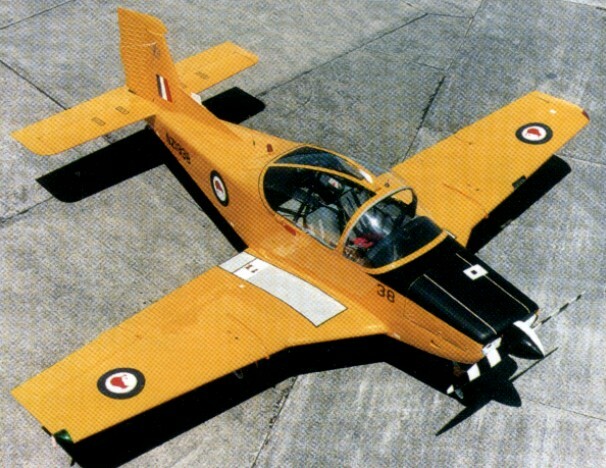 In 1981 the RAAF, looking to expand their fleet of CT-4A Airtrainers, opted to purchase the Breco CT-4B aircraft that had been in storage since manufacture. These aircraft went down the production line once again retaining their original serial numbers to be converted from the Breco CT-4B specification into the RAAF CT-4A specification. The last aircraft was completed in May 1982 and that seemed to be it for CT-4 production. With the purchase of NZAI by the Pacific Aerospace Corporation in 1982, the turbine project was taken out of the filing cabinet and re-examined. Initially mooted was the CT4/CR featuring the Allison 250-B17 turboprop engine and a redesigned wing to accommodate a retractable undercarriage. Subsequently it was decided to build an intermediate stage, the fixed gear CT/4C. With no airframes on hand to modify for the project, PAC approached the RNZAF and NZ1940, written off and reduced to spares was obtained. A 250 hp Allison turboprop, fitted with a PAC designed and built oil and fuel system to enable up to 30 seconds of inverted flight, was installed on 21 December 1990. Up front was a three bladed variable pitch Hartzell propeller. On 21 January 1991 the CT/4C was test flown for the first time, by chief test pilot John Muir accompanied by Murray McGregor. Downrated to match the 210 hp of the CT/4B, the Allison was able to maintain its horse-power through to 5000 feet. The CT/4C rotated at 60 knots and climbed away at 90 kts. The engine horsepower was increased to 300. At 300 hp John Muir described the aircraft as very quiet with more noise coming from the slipstream than the engine. Cruise on 300hp proves out at 165 knots (25 knots above the CT/4B on 75 percent power) and has a 2000 foot per minute climb rate at 105 knots. The stall is clean 58 knots, full flaps 48 knots. The engine uses about 80 litres/hour. In 1990, PAC proposed one major change to the new batch of Airtrainers; introducing an inverted oil system to permit extended inverted flight, a modification developed from the Christen system implemented by the RNZAF. The change is to be incorporated by Teledyne Con-tinental at the factory level as the IO-360--HB9. The contract to provide this training was awarded to BAe/Ansett in NSW (later BAe Systems Australia) who in 1990 ordered 12 CT-4 Airtrainers to undertake the task. These were produced as civil CT-4B models during 1991 and 1992. The RTAF, aware that the CT-4 was back in production, placed an order for 6 CT-4B models and these were produced after the BAe/Ansett airframes taking total production to-date to 114. The CT/4E incorporates a larger engine and three-blade Hartzell prop. To compensate for the heavier engine, the wings were located further forward. The first CT/4E flew on 16 November 1991. Nothing further happened until 1996 when under the new Aeromotive ownership of PAC the Aeromotive Group was successful in securing a contract to lease of 13 CT-4E Airtrainers to the RNZAF. Production recommenced with a new serial number sequence for the CT-4E starting at s/n 200. The first CT/4E delivery to the RNZAF on 28 August 1998. The RTAF placed an order for 12 CT-4E aircraft and these were produced during 1999 and 2000. In the middle of the RTAF order s/n 216 was reconfigured from RTAF specifications and is operated by Aerotec Flight Training in Queensland, Australia. All models were certified under NZ CTA A-10. S/n 001 was retained as a demonstrator and then eventually sold to a NZ syndicate. S/n 064 - 077 sold to Breco and never delivered. Converted to CT-4A model and sold to RAAF. S/n 065 owned by PAC as ZK-PAC (prototype CT-4E). Not technically CT-4B although data plated as such. S/n 078 -096 sold to RNZAF. Traded in on CT-4E models in mid 1990s. Converted by Aeromotive to civil CT-4B and most operated by BAe Systems Australia.